We offer a wide range of water coolers and dispensers for rent or sale for our Rhode Island ( RI ) and Southeastern Massachusetts ( MA ) customers. A Crystal Spring Water cooler takes just minutes to install, requiring no plumbing, only a standard electrical outlet. 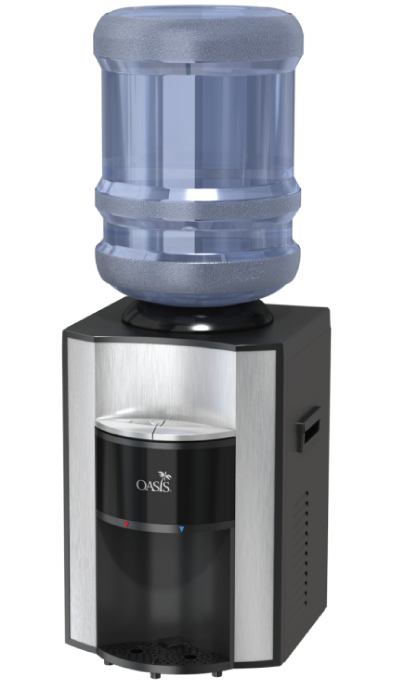 They're made by Oasis, the world's leading water cooler manufacturer and have a stainless steel cooling reservoir and a 3 year warranty. The price also includes delivery, setup and service after the sale, things you won't get if you buy a cooler at a discount store. No Spills And No Splash! Our water coolers (most models) feature the WaterGuard No Spill System. WaterGuard allows you to place the bottle on the cooler without removing the cap. You'll never spill water again when changing bottles. Serves piping hot water for tea and instant beverages/soups etc. as well as chilled water for drinking. Compact design uses approximately one square foot of floor space. Dimensions: 12.5" x 12.5" x 38" high without bottle/54-55" high with bottle. Serves room temperature water for cooking and cold water for drinking. Dimensions: 12.5" x 12.5" x 38" high without bottle/54-55" high with bottle. Crafted from solid porcelain with a lead free non toxic glaze, this dispenser can be used alone as a counter top dispenser or with the attractive oak floor stand. From traditional to contemporary, the ceramic dispenser blends into any setting. Dimensions: 25 " high with bottle/ 51.5" high with floor stand and bottle. 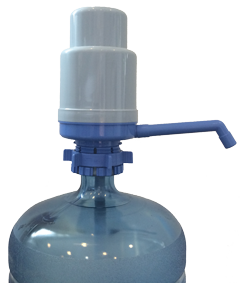 An easy to use pump to dispense spring water from a 5 gallon bottle. Simply push on the top of the pump and water flows from the spout. 3 FREE Bottles of Spring Water and your 1st month of Water Cooler rental is FREE. Pay refundable bottle deposits only on installation. Don't need a Water Cooler? Your 1st delivery of 3 bottles is still free.Pay only the refundable deposits. BE SURE TO READ OUR COMPETITOR'S FINE PRINT! It will take you awhile. Our competitor's "plans" list a price per "month" but they actually bill you 13 times per year. That's just not right. And, their lowest price option is usually not Spring Water. Often it's purified water from a municipal water supply. Don't be fooled. Crystal Spring has no "fine print". We just have great tasting Spring Water, competitive prices on exactly what you need and outstanding customer service.